Viola, member of the violin family, having four strings tuned c g d1 a1 (c = C below middle C; a1 = A above middle C). 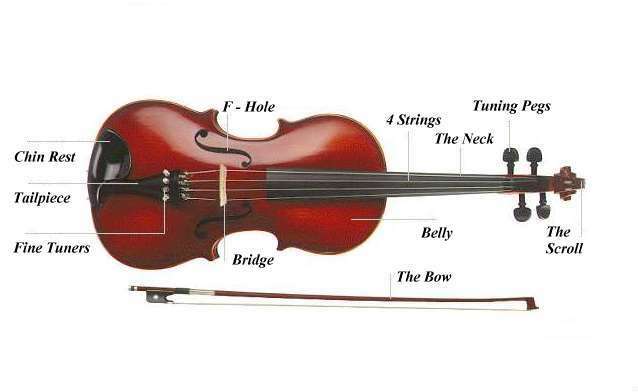 About 2 to 7 cm (1 to 3.5 in) longer than the violin, and tuned a fifth lower, the viola varies more in size than do the violin and cello. The Viola has a warm, mellow sound. The earliest surviving examples are two fairly large violas by the Italian builder Gasparo da Salò (1540-1609). Used prominently in such early works as the opera Orfeo (1607) by the Italian composer Claudio Monteverdi, the viola in the late 17th and 18th centuries took a secondary role, and smaller models prevailed. With the viola's resurgence in compositions such as the symphonic poem Harold in Italy (1834) by the French composer Hector Berlioz, and works by the German composers Johannes Brahms and Robert Schumann, large violas again predominated. Among 20th-century viola virtuosos were the Scottish player William Primrose and the German composer Paul Hindemith, who wrote many works for the viola. Other composers include the Hungarian Béla Bartók, the English Sir William Walton, and the Swiss-American Ernest Bloch.